Surprisingly, crossing the border out of Southern Sudan and into Uganda in February this year, was far easier than we had anticipated! Our visas had expired two months previously and we had been warned that we would receive a huge fine for this. However, Billy’s charm and the unusualness of our journey saw us through the border in a matter of minutes with a very small fine that we were happy to pay! We needn’t have worried. We were met with excitement, smiles and kindness at every turn! We soon learnt that most Ugandans had never seen a horse before! It’s difficult to imagine what it would be like to see a horse for the first time! Exciting and terrifying all at once! Typically we would be riding down the road past a school or through a village, and within seconds of us being spotted we would be surrounded by literally hundreds of people! The horses were so well behaved… People would be touching them all over, pulling their tails and talking and shouting at the top of their voices. The horses never once kicked or even pulled their ears back. On one occasion we were passing through a village that was voting. The voting officials had to ask us to move on quickly as all the voters had decided to come and see us instead of casting their vote! This happened so often with schools that Billy took to giving impromptu lectures about the horses and trying to give everyone a chance to ask us questions… Is that a camel or a donkey? Does it grow horns? Does it eat people? Is it a kangaroo? Why doesn’t it have cloven hooves? And the one that always surprised us generally asked by a young child… what is the gestation period of a horse?! We worked out that most of the horses in Uganda had been wiped out during the 60s under Idi Amin’s reign of terror. Since then, a few horses have been imported from Kenya and Zimbabwe, but most of them are in Kampala and surrounds. There aren’t many more than 100 horses in Uganda in current times. When we crossed into Uganda, there weren’t any vets available to get to the border to assess our horses, so we made our way to Gulu, a large town in the north. 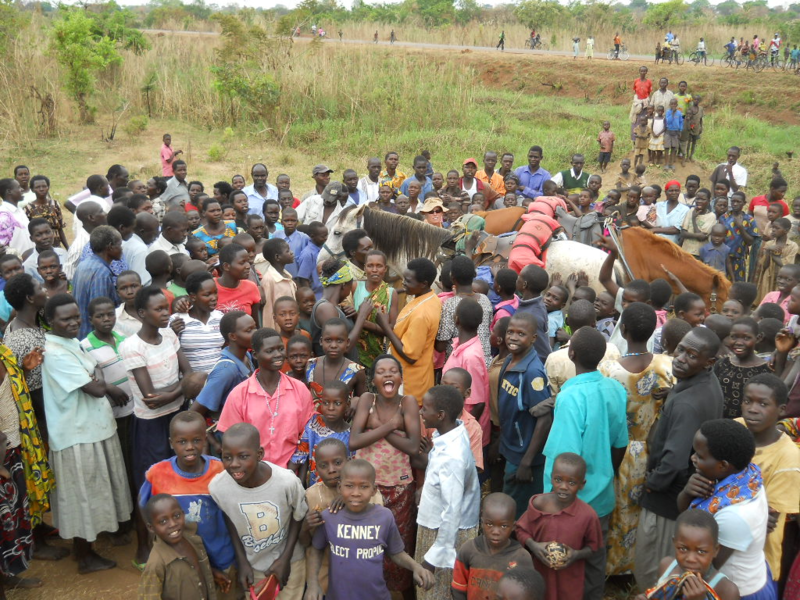 Here we found the Ugandan Veterinary Authorities and our horses were deemed healthy. We had to worm and dip them in accordance with Ugandan Law. Unfortunately, the horses were dipped with cattle dip which is much stronger than horse dip. Their backs were burning and we washed it off as soon as possible but the damage had been done… their backs were so sensitive that any pressure would have them dropping to their knees… this meant that we had to stay in Gulu for a week before moving on and that when we did, we did a lot of walking on foot to save the horses’ backs, sometimes as much as 18km per day. Uganda is an interesting country. It still feels very colonial… lots of old English type buildings and positions in office like Mayor and District Commissioner. It is also the first country in which we have witnessed democracy from grass roots level. The Ugandan people are very proud of their country and are showing an immense ability to bounce back. Up until about 5 years ago it was a country ravaged by the Lord’s Resistance Army that committed unmentionable atrocities. The LRA created many child soldiers, forcing them to kill their own families or to watch while their loved ones were raped, tortured and murdered. Most people lived in constant fear and all suffer a terrible grief as everyone has lost loved ones to these rebels. The lucky people lived in camps for twenty years and the rest would sleep out in the bush, terrified to be found in the villages that were regularly obliterated by the LRA. Today there are programs to reintegrate these child soldiers back into society and most people have moved back to their ancestral lands and are beginning to farm and to start a normal life for themselves. It’s humbling to witness. We finally made it to Kampala mid-May and had the pleasure of staying at the Backpackers lodge. The owner John Hunwick, an Australian who has been in Uganda for decades, was an avid horseman and insisted we stay with him free of charge while we got all our paperwork in order for the next country (Tanzania). He also gave the horses free run of his place… we did have worries that they would destroy some tourist’s tent but John was unconcerned! Whilst there, we decided to go to a good doctor and have some blood tests as Billy had been struggling with his health since leaving Khartoum. Billy’s results were not great. His blood count was so low; the doctor was surprised he had been able to walk through the door let alone cross the whole country on horseback! That night Billy was given a blood transfusion to enable him to fly to Johannesburg where he was diagnosed with Acute Myeloid Leukamia. I followed a few days later after securing a safe place for our horses to stay with an amazing lady who has 15 of her own horses. Our horses are treated as if they are her own and are looked after perfectly. We have now been in Johannesburg for nearly 4 months. Billy has been undergoing chemotherapy and is doing well. We have been warned that it will take some time for him to recover completely. Our horses are never far from our thoughts and we can’t wait to get back to them and get back on the road again. This is just another challenge for us to overcome. Having faced a lot of challenges on our amazing journey, we are in a good frame of mind to combat this. We know we can do anything if we put our minds to it. I hope that when the next Guild news bulletin goes out, we can write that we are reunited with our horses and back on the road!